An automated process may need to assign a value to an attribute that contains a concatenation result of two or more strings. Suppose the first Task of the Purchase Request Process (Create Purchase Request), references three attributes (First Name, Last Name and Full Name). The Full Name attribute will be read-only, and will contain the result of concatenating the First Name and Last Name of Purchase Requester. 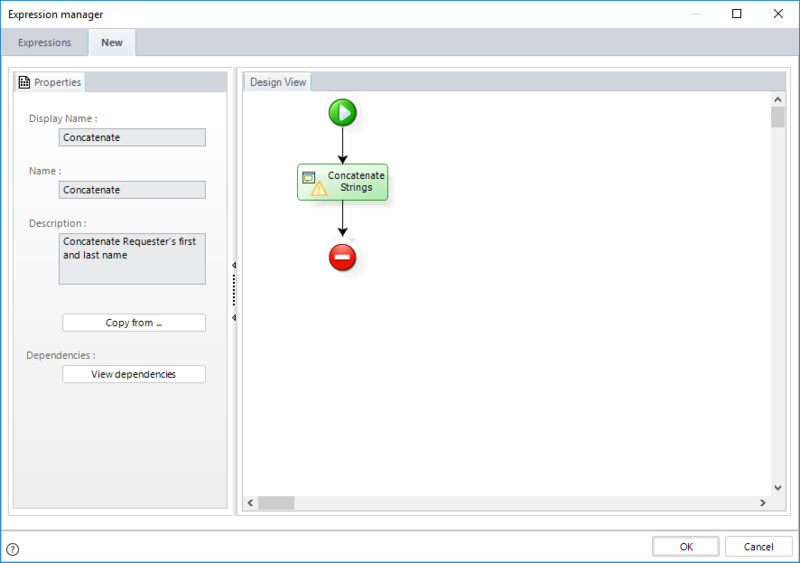 1.In the fourth step of the Bizagi Process Wizard, select Activity Actions. Click the Task where this action will be performed, and create an Expression. 2. Type the Name, Display Name and Description of the expression. 3. In the Expressions Editor, add the variables FirstString and SecondString that are to be used in the expression as indicated below. 4. 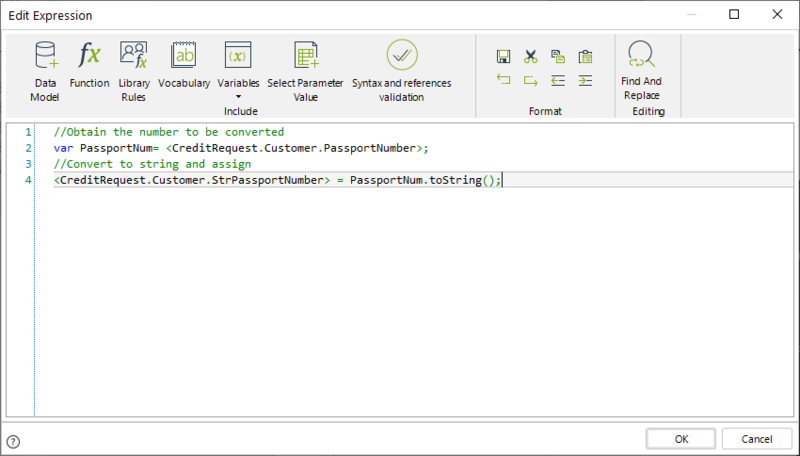 Create an expression to concatenate First Name and Last Name, and assign the result to the FullName variable. The concatenation is easily done by using the addition (+) operator as shown in the image below. Once the expression is associated with the process, the user can test the functionality. In the images below, the three Attributes are displayed before, and after the expression is executed. Once the expression performs the concatenation, it can be evidenced in the Full Name control. 1. Create the following variables for your expression. 2. 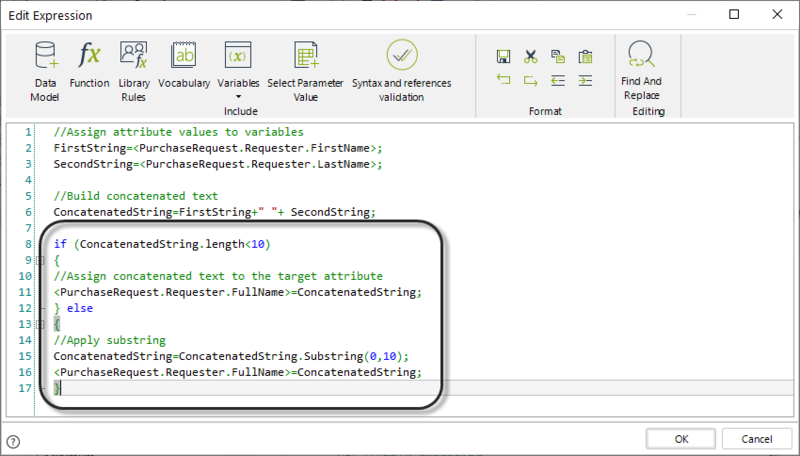 Apply the .ToUpper method to the concatenated string, and assign the result to the target attribute. Note the expression is associated with an On Save event. Once you click Save in the corresponding Task, the expression will execute, and the Full Name field will be valued with the concatenation result of the First Name and Last Name, presented in capital letters. The Substring function allows you to obtain a subset of the symbols in a string, where the order of the elements is preserved. 2. Include the Substring sentence into the expression. Substring returns the specified number of characters given the position of the initial character. For instance, if you apply a substring to the text "Bizagi" with parameters 2,2 (String.Substring(2, 2)) you will obtain "za". The next image shows the expression to obtain the initials of the Purchase Requester. The expression is associated with an Event On Save. Once the user presses the Save button, the expression will be executed. The Full Name field will be updated with the initials of the First Name and the Last Name. Suppose we wish to validate that the concatenated string we obtained in the previous example of this section has, as maximum, 10 characters. If the concatenated string has more than 10 characters a substring must be applied to resize it to the required length. For our example it will be used to establish the condition of the validation as follows. Suppose that in a Loan Request process the passport number of customers is stored in an Integer type attribute. This number is used as parameter in a web service to consult credit blacklists, however the exposed services receives a string type parameter so a type conversion is needed from integer to string. Suppose that in a Loan Request process the passport number of customers is stored as a string type attribute. This number is used as parameter in a web service to consult credit blacklists, however the exposed services receives an integer type parameter so a type conversion is needed from string to integer.